Testing is always a good thing. Testing at a track you’ve never been to before is an even better thing. 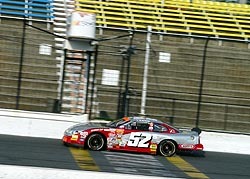 Testing at one of the toughest Short Tracks around is invaluable. That is why so many drivers, including several rookies and first-timers, took part in an open test session at Concord Motorsport Park (NC) on Monday to get ready for this weekend’s Pro Cup Southern Division race at the tricky half-mile. Concord is one of “those” tracks. It is a track everyone’s heard of, but unless they’ve seen it, they can’t get the full idea of what it is like. It is a half-mile, tri-oval. There are three turns. The second turn is actually a “dogleg” in the middle of the backstretch. 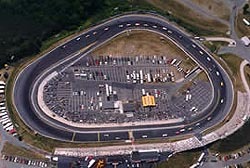 Think of it as a half-mile version of Pocono Raceway in Pennsylvania. It is a track that some love, some hate, scares others and everyone respects. So that is why so many “first timers” showed up on Monday. The Monday tests have become a regular among the Pro Cup cars this year. And at Concord, just as many drivers took part. In the morning, Shane Huffman, Michael Faulk and Toby Porter all spent time on the track, while things got much busier in the afternoon, as Mark McFarland, Shane Wallace, Ken Buttler III, Jay Fogleman, Kirk Leone, Daniel Johnson, George Brunnhoelzl III and Clay Rogers all tested. 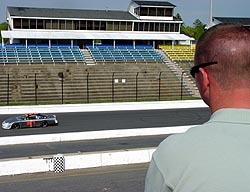 Along with those on the track, there were plenty of interested observers at Concord as well. Some were other Pro Cup drivers. Some were drivers from other series and other parts of the country. Leone was only able to be at the track for a little over an hour, but that seat time was priceless. Kirk Leone got his first taste of Concord on Monday. was the best hour I’ve gotten behind the wheel of a car in a while. We were hoping to get here earlier, but we had a lot of work to do on the car from running Peach State (Saturday). I think if I can get a full day here, we’ll be pretty good. One of the most improved drivers from Lakeland until now during the Pro Cup hear has been that of rookie Ken Butler. Butler will admit that he had his share of problems, but with more and more seat time, has gotten better. He’s been to Concord before, when he tested an ASA car at the track last year. But as everyone else agrees, the more seat time the better. “These (Pro Cup) cars are a lot harder to steer,” said Butler. “They are heavier and more powerful than the ASA car. We were actually slower in the ASA car then we were in this car, which was a little surprising. You could think an ASA car would be faster. But maybe I’m just getting better. I am still working on this track. It is a different track than what I’m used to. Mark McFarland, despite his vast racing experience, drove onto the Concord track for the first time ever on Monday as well. “I’ve never been here, but some of my guys have been here before,” said McFarland, who drives for JR Motorsports. “This test helped a lot. I was a little worried about this place from hearing people talk about it. We got the opportunity to come, so we came here to pretty much just get me dialed in. The car is actually pretty close I think. But there wasn’t just rookies out there testing. There were plenty of guys that have plenty of laps around the Concord track testing too; namely, Clay Rogers. 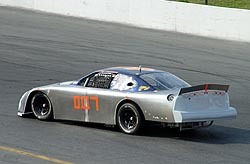 Rogers, who was a regular at Concord in Late Model Stocks for several years, was testing too. Clay, along with younger brother Brad, who was also a regular at Concord, were both in attendance on Monday, but Brad was just there helping out older brother. Shane Huffman (right) was an interested observer on what kinds of times the guys were running in the afternoon. The test wasn’t very long for Clay, who along with his team, had spent most of the day on Sunday and all of Sunday night working to get the car ready. They reclipped it and had to put an entire new body on the car, among other various fixes. “We ran in the 90s right off the trailer. So I’m pretty happy with that. The fastest I think anyone has run is a (16.)66. fast, turning one of the best times in the afternoon, along with McFarland. The Pro Cup cars will race on Saturday at Concord. Speed51.com will be there and have a full recap of everything that goes on. 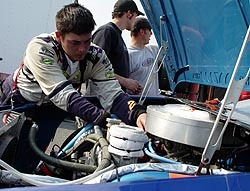 George Brunnhoelzl works on his engine at the test. He was fast, but had engine problems during the day. It wasn’t just drivers on the track though on Monday. There were racers at the track too. Along with Brad Rogers, rookie contender Andrew Rogers (no relation to Clay or Brad) was also at the track, working with and observing Clay. Also walking around in the afternoon was Huffman, who tested in the morning, but just watched the afternoon session. Also seen around the pits was veteran NASCAR Whelen Modified driver Donny Lia. Lia was in Charlotte and came to the track to get a feel for what the USAR Pro Cup Series is all about.